When you see a photo of a beautiful outdoor location, do you feel overcome by an insatiable wanderlust? Are you forever in search of your next adventure? The hike to Havasupai is an essential for your wandering soul! Havasupai is a breathtaking tropical paradise hidden in the most unexpected place: the desert of the American Southwest. One of the first questions that comes to mind is often how difficult is the hike into Havasu Falls? The hike into Havasupai is a great one for novice and advanced backpackers alike with options to carry all your own gear or have a mule/packhorse carry the majority of the weight for you. That said, hiking to Havasu Falls is not easy, so plan ahead, prepare for heat, dust, and a long day. The stunning beauty of Havasu Falls and the other waterfalls is well worth the effort, your tired feet will forget all about those ten miles they just covered once they’re splashing in the vibrant blue pools! 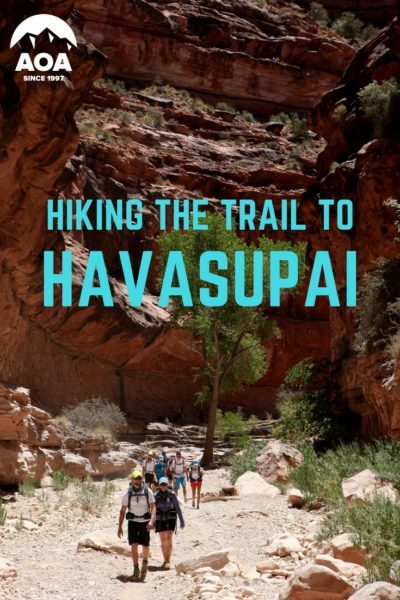 Get your guide to everything you need to know for planning a trip to Havasupai. 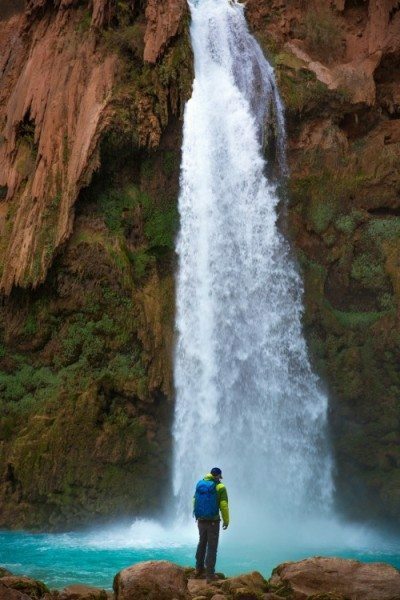 Now that we’ve got your attention, you’re likely asking how do you hike to Havasu Falls? You will start your journey at Hualapai Hilltop at 5,200 feet. The beginning of the trail can be a little daunting, you look down and see nothing but a deep, seemingly endless, canyon and Switchbacks. The trail descends about 1,200 feet in the first mile and half, first switchbacking down, then steeply descending into the red Supai sandstones. There is very little protection from the unforgiving desert sun so it’s wise to start your day early since you’ve got about four to six hours of hiking ahead of you. The switchbacks make for a pretty deep descent and can be rough on the knees, but only last for one mile! Hiking poles are recommended for the hike into Havasupai, and definitely create a more pleasant journey into the canyon. Good sturdy hiking shoes will do wonders! 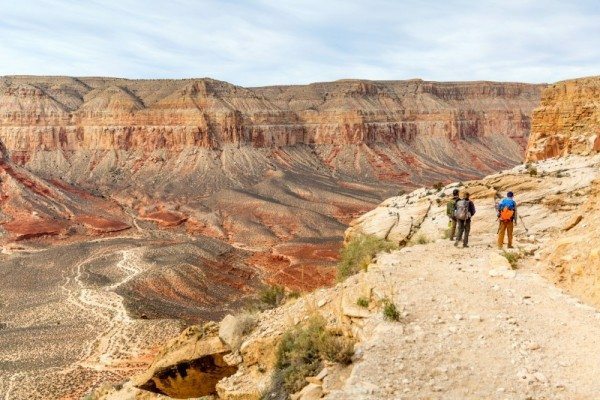 Just when you start to get tired and potentially bored of walking through the same scenery, you’ll come across the junction where the trail through Hualapai Canyon meets Havasu Canyon and will see a sign pointing you towards Supai village. Not long after that sign, the landscape transitions to a lush oasis but this is no mirage, that vibrant turquoise water is real! You’re now hiking alongside Havasu Creek under the shelter of shady cottonwood trees. With eight long miles behind you, you will finally reached Supai Village. Your first stop is the tourist office, then check out the village. There is a tiny market and a café around a dusty square. The market has ice cream which will be a welcome treat after a hot afternoon hike. Remember though, this is only resting point, you have two more miles of hiking until you reach the campground. Finally, you’ll start the final stretch to the campground. These last two miles will fly as the excitement to reach the falls builds. As you begin the last descent of the hike leading to the campground, the sound of the waterfall will hit you before you see it. It won’t be long before you get your first view of the falls. Havasu falls plummets 100 feet into a beautiful wide blue-green pool. Take a moment to rest while you admire the falls, then make the final steep descent to the campground and find a spot to relax. The falls will be waiting for you after you’ve finished setting up.